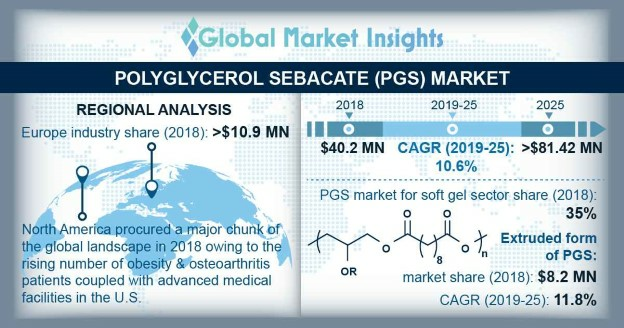 Polyglycerol Sebacate Market size will exceed USD 81.42 million by 2025; according to a new research report by Global Market Insights, Inc. Rising population, improved healthcare facilities in developing economies, growing implantable medical surgeries, technological advancement in cardiovascular tissue engineering along with rise in R&D activities to replace traditional materials with innovative biomaterials will primarily drive the polyglycerol sebacate market till 2025. Polyglycerol sebacate (PGS) is a glycerol ester polymer created by polycondensation between glycerol and sebacic acid to form a prepolymer resin which is then converted into thermoset elastomer. The raw materials sebacic acid and glycerol can be obtained by inexpensive sources and are highly regulated globally. PGS finds application in tissue engineering, adhesives, coatings, drug delivery and other upcoming applications such as scaffolds, valves etc. PGS is also used in combination with other biodegradable resorbable polymers for cardiovascular tissue applications. 3D printed scaffolds show a promising polyglycerol sebacate market during the forecast period. PGS has gained popularity in regenerative medicine industry due its elastomeric properties and successful use with many applications. PGS is used as coating for improving the properties of bio textiles and promote healing process. PGS can be coated on wide range of bioresorbable bio textiles such as PET vascular grafts, polyglycolide, polypropylene hernia mesh, polyethylene heart valves. Although PGS is a comparatively newer materials as compared to other biomaterials including polylactic acid, polycaprolactam, poly lactic acid copolymers such as (poly-L-lactide) PLLA, (poly-D-lactide), collagen, chitosan, the market potential for PGS to replace the above biomaterials is huge because of regulated raw materials, standard manufacturing process, close resemblances and performance of PGS with natural tissue. Tissue engineering applications, especially in cardiovascular tissue replacement itself provides a huge potential market for PGS because of its unmatched elastomeric properties. PGS also can be fabricated into highly porous scaffolds that mimic the natural tissue characteristics. As the raw materials required to manufacture PGS comes from renewable sources, this polymer has attracted interest of many company globally. Although, there are very few companies operating in the PGS market at present, more companies are expected to enter this market in the coming years. Increasing R&D activities for improved materials, use of co polymers, high cost of polymers and use of traditional surgical methods in developing nations will show some adverse impact on the PGS market that will restraints its full growth to some extent over the projected years. Also, long term availability of data on biocompatibility & biodegradability is unavailable. PGS resin is being widely used in variety of biomedical applications as it exhibits both biocompatibility and biodegradability properties both highly important for biomedical applications. PGS involves cost effective production and can be up scaled easily with less complicated machinery. Also, the mechanical properties along with the degradation kinetics of PGS can be tailored to match the requirements of intended applications by controlling curing temperature, curing time, reactants concentration and degree of acylation in acrylate PGS. Because of the flexible and elastomeric nature of PGS, its biomedical applications have mainly targeted soft tissue replacement and the engineering of soft tissues, such as cardiac muscle, blood, nerve, cartilage and retina. However, applications of PGS are being expanded to include drug delivery, tissue adhesive and hard tissue (i.e., bone) regeneration among others. North America will have the largest share of the polyglycerol sebacate market by 2025. Rise in old age population, continuous R&D efforts, innovations in implant design and availability of advanced medical devices, rise in accident and trauma cases will fuel the North American PGS market. At present, only Secant Group is a leading player of PGS resin in the business. However, there are many companies which produce PGS inhouse and consumer for laboratory and research purposes.